​When we re-connect with the Earth, balance is restored! 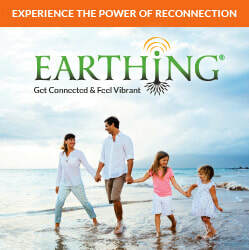 Earthing is a fast-growing movement based upon the discovery that connecting to the Earth’s natural energy is foundational for vibrant health. ​Through direct contact with the surface of the Earth our bodies receive a charge of energy that makes us feel better, fast. What started as a theory has now been scientifically validated and best of all, it's free for the taking! ​Just as the sun gives us warmth and vitamin D, the Earth underfoot gives us food and water, a surface to walk, sit, stand, play, and build on, and something you never, ever thought about—an eternal, natural, and gentle energy. Think of it perhaps as vitamin G—G for ground. What does that mean to you? Maybe the difference between feeling good and not so good, of having little or a lot of energy, or sleeping well or not so well. You can’t see the Earth’s energy but some people can feel it as a warm, tingling, and pleasant sensation when they are out walking barefoot along the water’s edge at the beach or on a stretch of dew-moistened grass. For the past 50 years we have been isolated from the Earth by non-conductive materials such as rubber and plastic (our shoes), wood, plastic, laminate, and asphalt (flooring surfaces), living in high rise buildings, all producing a very deleterious affect on our bodies. This dis-connect can cause, increased inflammation which many doctors say contributes to numerous health issues. What can be done to correct this? ​Learn more how you get the benefits of "EARTHING", even if you can't get outside everyday--Watch the "Grounded" video below and be amazed! 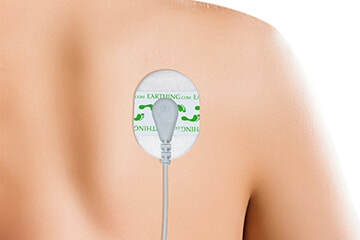 Click the image below to watch the ground breaking documentary video "GROUNDED" and to get more information on the benefits to the human body of Earthing.